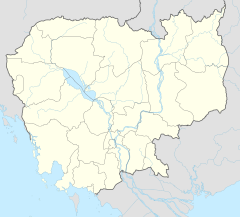 Choeung Ek (Khmer: ជើងឯក [cəəŋ aek]) is the site of a former orchard and mass grave of victims of the Khmer Rouge - killed between 1975 and 1979 - about 17 kilometres (11 mi) south of Phnom Penh, Cambodia. It is the best-known of the sites known as The Killing Fields, where the Khmer Rouge regime executed over one million people between 1975 and 1979. Mass graves containing 8,895 bodies were discovered at Choeung Ek after the fall of the Khmer Rouge regime. Many of the dead were former political prisoners who were kept by the Khmer Rouge in their Tuol Sleng detention center and in other Cambodian detention centers. ^ Doyle, Kevin (2005-04-11). "The Revenue Fields". Time. Retrieved 27 July 2010. This page was last edited on 22 January 2019, at 01:44 (UTC).